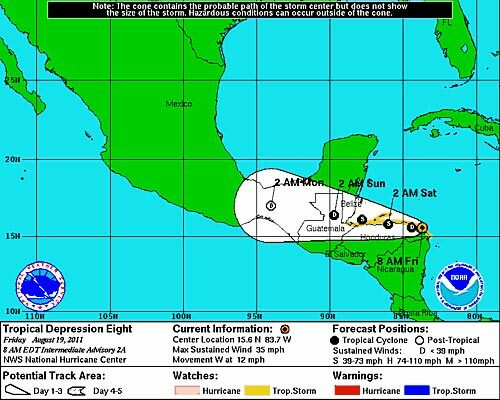 Tropical Depression Eight became Tropical Storm Harvey at mid-day today. The centre of the system is latitude 16.3 N, longitude 84.2 W. This position is about 270 miles east southeast of Dangriga. The TS is moving towards the west-northwest at 10 miles per hour and is expected make land fall by late Saturday evening that is the 20th of August 2011, tomorrow. The present forecast track takes the system just to the north of Dangriga. Wind speed is presently 40mph and additional strengthening is forecast. 3-5 inches of rainfall is expected. The Government of Belize has declared a Tropical Storm Warning for the entire coast of Belize. We are in the Red Two Phase of the National Emergency Warning System.